This is such an easy dessert yet it looks so impressive and tastes wonderful. 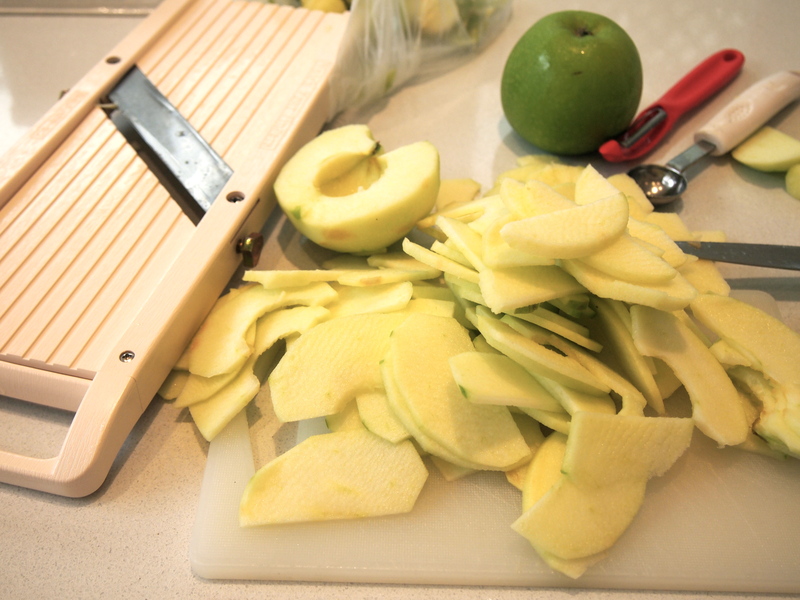 The hardest part is slicing the apples thinly but if you have a mandoline even this is a cinch. 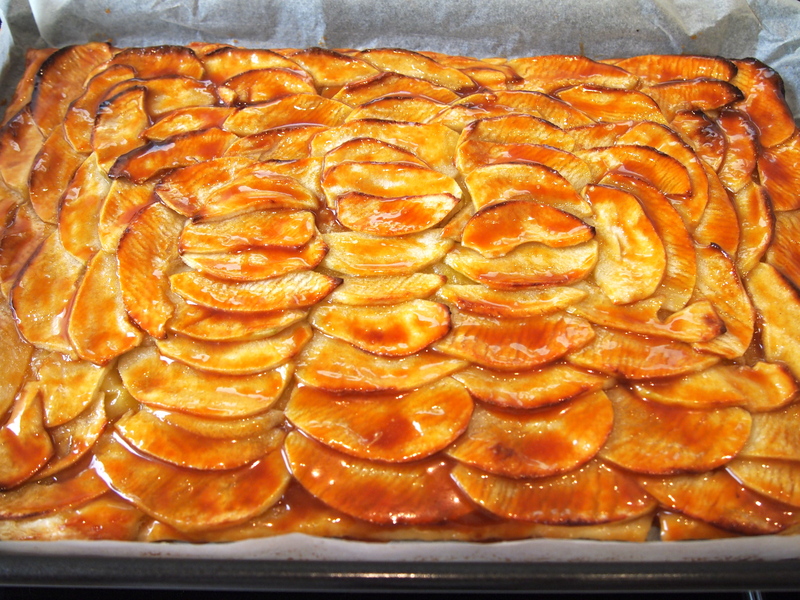 Store bought all butter puff pastry – and it does need to be a really good quality all butter one, is placed on a sheet pan and topped with very thinly sliced apples. 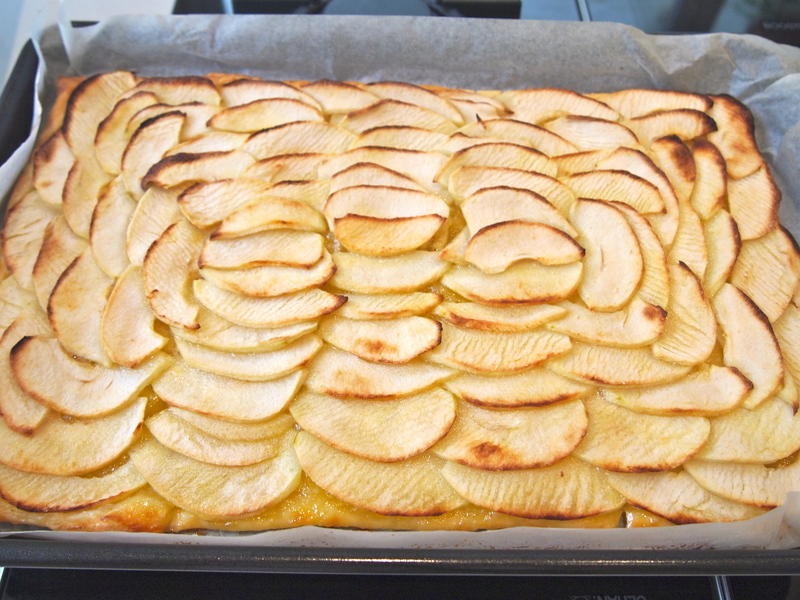 The apples are then dotted with butter and sugar before being baked. While the tart is baking a very simple caramel needs to be made which is then brushed onto the tart before being baked for a few more minutes. 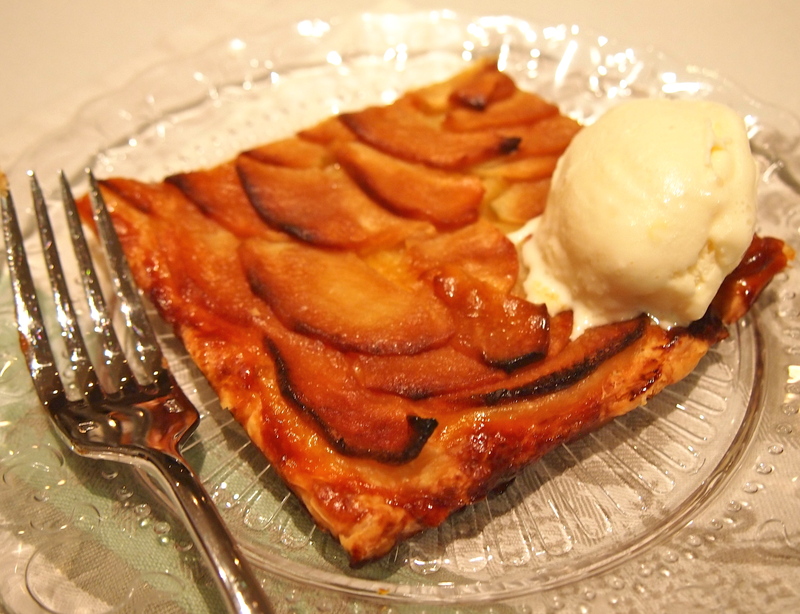 What comes out of the oven is a rich, deeply caramel coloured, ever so thin buttery tart. The hint of salt in the caramel transporting it to another level. Ina Garten makes a similar tart but brushes it at the end with some warmed apricot jam, which is the more classical French method. I’ve been wanting to try Ina’s French apple tart for a while but after seeing this version on Smitten Kitchen I knew it was going to knock the traditional tart out of the park. Serve it with vanilla ice cream if you’re having this as a dessert but it’s perfect on it’s own for morning or afternoon tea. Heat oven to 200C. Line a rimmed baking sheet or jelly roll pan with parchment paper. The ideal size is a 10×15-inch jelly roll pan. 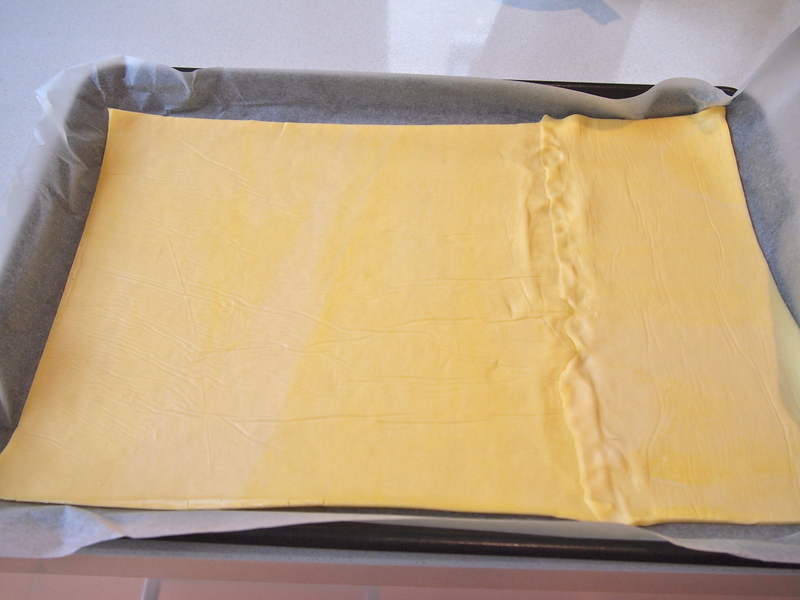 If you’re using a block of pastry then roll it out on a lightly floured board to the size of the jelly roll pan. I used ready rolled puff pastry as it’s the only all butter pastry my supermarket sells. In which case you’ll need to do a bit of a cut and paste job as in the picture below. 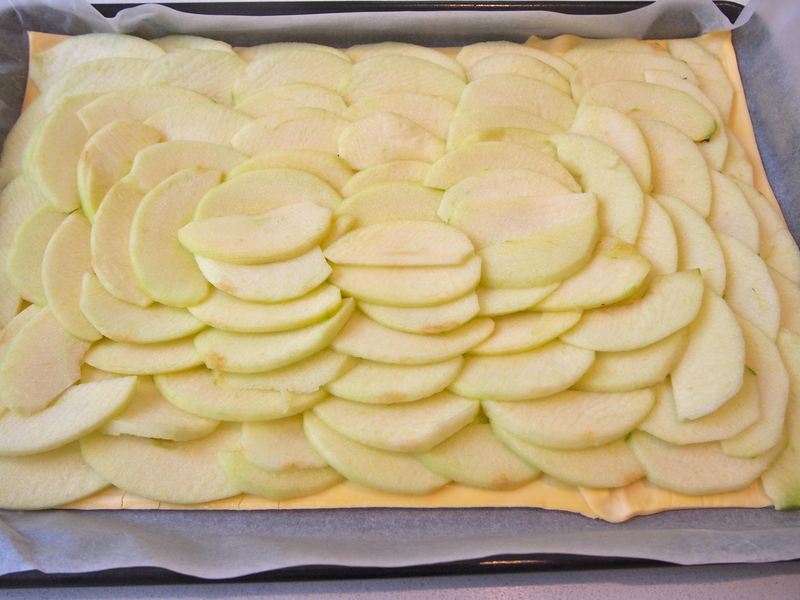 Carefully transfer the pastry onto the parchment paper and put back into the fridge while you prepare the apples. Peel the apples and cut them in half top-to-bottom. Remove the cores and stems (use a melon baller and/or a pairing knife). Slice the apples halves crosswise as thinly as you can with a knife, or to about 1/16-inch thickness with a mandoline. Remove the pastry from the fridge and fan the apples around the tart in slightly overlapping concentric rectangles — each apple should overlap the one before so that only a little bit of the previous apple will be visible — until you reach the middle. Sprinkle the apples evenly with the first two tablespoons of sugar then dot with the first two tablespoons butter. 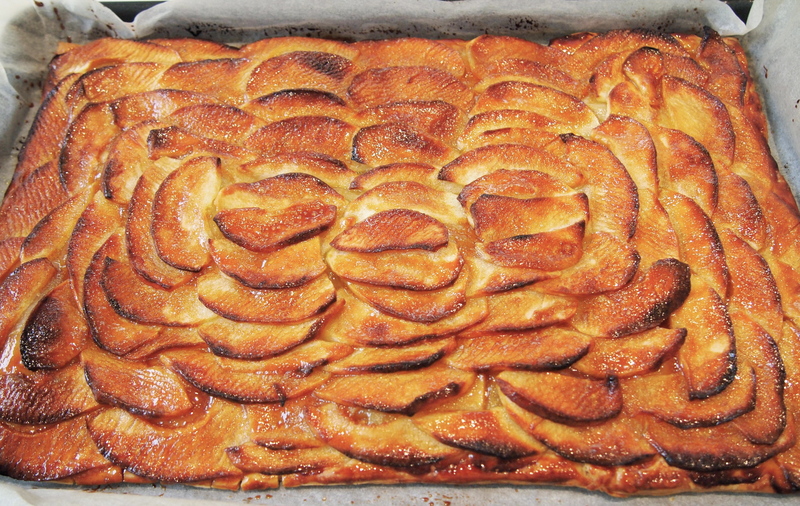 Bake for 30 minutes, or until the edges of the tart are brown and the edges of the apples begin to take on some color. If you sliced your apples by hand and they were on the thicker side, you might need a little more baking time to cook them through. The apples should feel soft, but dry to the touch. While the tart is baking make the glaze. In a small saucepan over medium-high heat, melt the last ¼ cup sugar, this will take about 3-4 minutes. Cook the liquefied sugar to a nice copper color, another minute or two. Off the heat, add the sea salt and butter and stir until the butter melts and is incorporated. Add the heavy cream and return to the stove over medium heat. 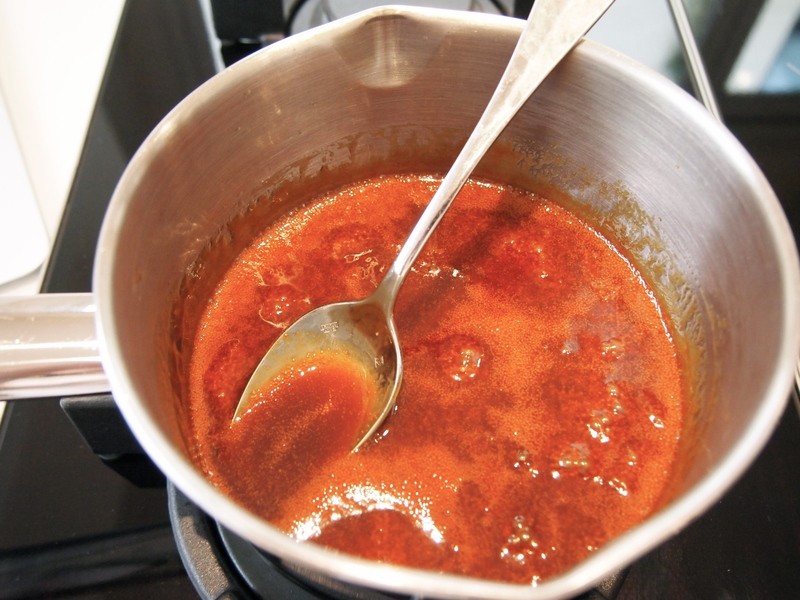 Cook, stirring constantly, until you have a lovely, bronzed caramel syrup, just another minute, two at the most. Set aside until needed. After the tart has baked, remove it front the oven. Using very short, gentle strokes, and brushing in the direction that the apples fan to mess up their design as little as possible, brush the entire tart, including the exposed pastry, with the salted caramel glaze. You might have a little leftover. Return the apple tart to the oven for 5 to 10 more minutes, until the caramel glaze bubbles. 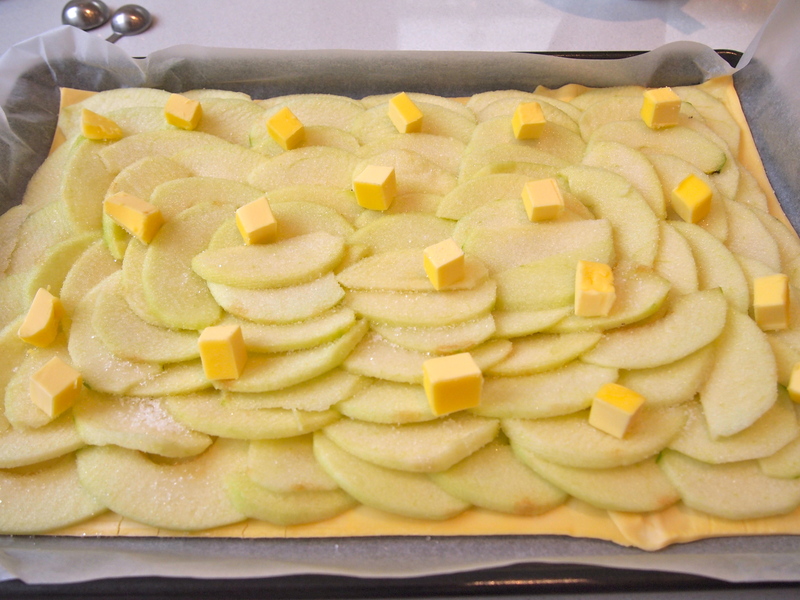 Let tart cool complete before cutting into squares. Serve plain, with coffee or tea, or with a scoop of vanilla ice cream, for dessert.